River Valley senior Layne Fitch (2) releases a shot attempt over a Nelsonville-York defender during the first half of a Jan. 4 boys basketball contest in Bidwell, Ohio. BIDWELL, Ohio — Caught in the middle. 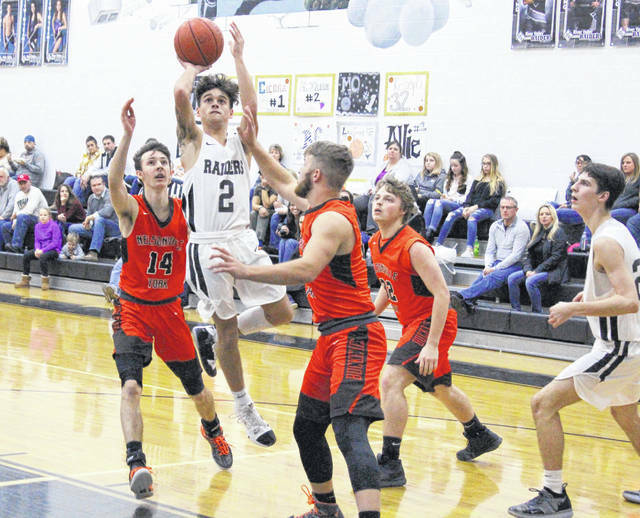 The River Valley boys basketball team built a 14-point first quarter lead, but visiting Wellston made a 37-22 charge over the next two frames and ultimately held on to claim a 62-58 victory on Tuesday night in a Tri-Valley Conference Ohio Division contest in Gallia County. The Raiders (2-13, 0-9 TVC Ohio) put together one of their better shooting efforts of the season as the hosts shot 48 percent from the field, which included an 8-of-15 performance in the opening canto en route to building a 19-5 advantage. The Golden Rockets (3-13, 2-7), however, countered with five points apiece from Jordan Carey and Brice Randolph as part of a 21-15 run before the break — closing the gap down to 34-26 at the intermission. Ryan Madison poured in seven points during a pivotal 16-7 third period surge that allowed WHS to claim a slim 42-41 edge, then the Blue and Gold netted 9-of-13 field goal attempts down the stretch as part of a 20-17 run that ultimately wrapped up the four-point outcome. Wellston also claimed a season sweep after posting a 46-36 decision at WHS back on Dec. 21, 2018. The Silver and Black outrebounded the guests by a 25-22 overall margin, but the Golden Rockets did manage an 11-7 edge on the offensive glass. RVHS also committed 20 turnovers in the setback, three more than Wellston’s final tally of 17 miscues. The Raiders netted 21-of-44 field goal attempts overall, including a 4-of-18 effort from behind the arc for 22 percent. The hosts were also 12-of-16 at the free throw line for 75 percent. Jordan Lambert paced River Valley with 20 points, with 13 of those coming in the fourth stanza. Layne Fitch was next with 15 points, followed by Brandon Call with nine points and Chase Caldwell with seven markers. Darian Peck contributed six points, with Rory Twyman and Myles Morrison respectively rounding things out with four and three points. Wellston made 24-of-47 shot attempts for 51 percent, including a 5-of-16 effort from 3-point territory for 31 percent. The Blue and Gold were also 9-of-18 at the charity stripe for 50 percent. Madison led WHS with 20 points, followed by Carey with 12 points and Hunter Smith with nine markers. Randolph and R.J. Camp were next with seven points each, with Jarrett Wilson chipping in three points. Josh Bodey and Donnie Watters completed the winning tally with two markers apiece. River Valley returns to action this weekend when it travels to Southern on Friday for a non-conference tilt, then heads to Gallia Academy Saturday for a battle between Gallia County programs. Both contests will tipoff at 6 p.m.